Recently someone gave me a few of these very interesting little cards. They are the size of business card, and use that minimum of space to share vital information about the nature of DID. In the event of a crisis I imagine they could be very helpful! They also provide a link to a website in the UK – you can find it here. It’s quite comprehensive with a lot of information and resources. I would love to set up something like that here in Australia! I’m going to chat to the members of Bridges and the Dissociative Initiative about perhaps making up our own cards of information like these. One of the things I’d like to see is a second complementary card that discusses dissociation. Something that frustrates me a great deal is that in all the hype over multiplicity, those dealing with dissociation that presents in other ways – such as amnesia, depersonalisation, loss of senses etc. can be overlooked. Multiplicity is one manifestation of dissociation, but severe and chronic dissociation in any other areas can be equally distressing and disabling. I’ve been searching for books on dissociation but not multiplicity for Bridges (as the group offers support to people with either experience) and I’ve been quite frustrated at the appalling lack of information out there! The majority of the books in this field concentrate on either general trauma phenomenology, or multiplicity. There are some possibilities coming up that perhaps more training and resources will become available here in SA soon. I’m very mindful that at present, while we have the group Bridges, we lack supports for carers/family, and also training opportunities for support workers and professionals. Talks are happening about what we can do in these areas, which is very exciting to me! A year and a half down the road from my first terrified talk about DID, I can now see what I’d like to change about the talk I wrote and better ways to present the information to make it easier to understand. Building a library of books and accessing journal articles in these fields has been absolutely invaluable to developing my framework and understanding of dissociation, multiplicity, trauma, and recovery, as has so many people generously and courageously sharing their personal experiences. There is so much to learn yet, but even the little we know now could make such a huge difference to so many people out there. It breaks my heart that so many people are suffering so needlessly and so alone with these experiences. I am furious that some staff are still telling people that dissociation doesn’t exist or all symptoms are invented for attention. I am so distressed by the chronic pain, high levels of suicidiality and self harm within a population that has one of the best responses to appropriate support of all the mental illnesses! There is hope and there is help, but so many people don’t know that yet. There’s a lot of work to be done here. I did a course in Mental Health First Aid a little while ago, and it really frustrated me that a dissociative crisis wasn’t mentioned. Most people don’t know what one is, how to recognise or support someone in that situation. We talked about suicide, drug overdoses and panic attacks, which was great. Dissociation is also extremely common, often overlooked, and can be deeply distressing. Knowing how to recognise it and reassure someone in crisis that they are not going crazy, that these experiences are common and can be managed can sometimes make the difference between life and death. This is not rocket science! We can do this. We can make things a whole lot better for a lot of confused, scared, lonely, creative, resilient, amazing people out there who deserve a better deal. great resource! I’d seen the PODS cards before and wondered if this was a different version of the same idea, but nope – it seems they are pretty unique! In the past PODS have been able to post them to local organizations in the UK if you have a contact there that would appreciate them – they are useful for support workers or the voluntary sector to refer to in particular. Such a great idea! Anything you could suggest could be added to http://sites.google.com/site/traumaanddissociation so just get in touch via the google plus group, wordpress or the Facebook page is we can add more. Your DI blog is on there, as is the Australian DID therapy information. PODS are now doing booklets with different resources, and their magazine is excellent (backcopies are online). http://dissociation.co.uk is useful – run by the former president of the European Society for Trauma and Dissociation. There is also Izzy’s Promise which was setup by Laurie Matthew – her book Fight, Rabbit, Fight and pretty unique and her autobiography Groomed has been out about a year. Everything right now seems to be in separate places, its hard to connect it all. Wonderful to hear from you! You're very welcome for the review, and I like the name change! The Dissociative Initiative here is pretty small and only starting out, but I would love to develop some of the resources and supports you have at PODS, and I think we're on the way there. 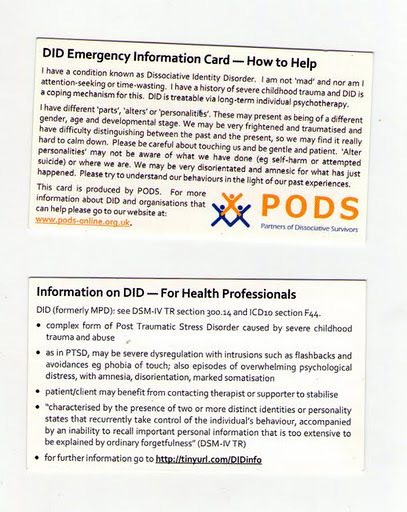 Hi Sarah, I am part of PODS (run by Carolyn and Rob Spring)- the UK organisation which produced these cards. THANK YOU for posting about them. We are really excited that they have made it all the way across to Australia!! And so seeing these cards in Australia and hearing that they have been helpful is a wonderful encouragement to us. Thank you! Well, yes! I'm hoping for at least some funding to be able to buy InDesign – the software to layout a self published book, and some training to learn how to use it. That would at least get a prototype off the ground! I came across an arts funding report recently, if they give some guy $7000 to make a CD why not give an author $7000 to publish a book, or even $2000 on tutoring on how to write non-fiction.